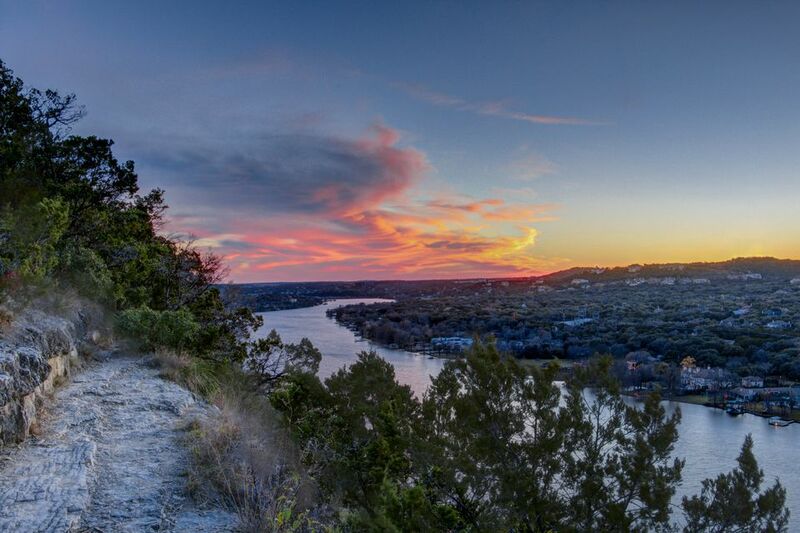 For people from mountainous regions of the country, the name Mount Bonnell may seem like a bit of a stretch. By most definitions, the 775-foot peak would qualify as a large hill. However, it is one of the tallest in Austin. Even if you're not impressed by the height of Mount Bonnell, it’s still an excellent place to get an overview of the city and enjoy a spectacular view. Although it's possible to take the number 19 bus from the Texas State Capitol to the general vicinity of Mount Bonnell, you’d still have a 30-minute walk to the hill after getting off the bus. Since this area of town is not well-served by the city’s bus system or any other type of mass transit, you’d be better off using a ride-hailing service or taking a cab. If you’re driving from the downtown area, take 15th street west to the MoPac Highway, proceed on MoPac (aka Loop 1) north to the 35th Street exit. Take a left on 35th street and continue for about a mile. Then take a right on Mount Bonnell Road, and you’ll soon see the free parking area on the left. The park charges no admission and is usually unattended. Take note that there are no bathroom facilities. The street address is 3800 Mount Bonnell Road, Austin, Texas 78731. While it’s a fairly easy climb straight up the side of the hill, some of the steps are uneven, so make sure you watch your step. And if you’re not in tip-top shape, remember to pause periodically to catch your breath. At a relaxed pace, the climb to the top should take about 20 minutes. A railing along the middle of the stairway can help you maintain your footing. The hill is not accessible for those in wheelchairs. Curiously, some sources seem to disagree about the number of steps at Mount Bonnell. The count ranges from 99 to 106. It could be that some people are unsure about whether to count some of the uneven, irregular steps. Or maybe the people doing the counting are always too tired to get it right by the time they reach the top. Whatever the reason for this discrepancy, this offers parents an opportunity to keep their kids engaged while making the climb. Get them to count the steps as they go, and then you can compare counts and reach a consensus as a family once you reach the top. The view is great all year, but everything is much greener in spring and summer. Of course, if you have allergies, springtime on the hill can be challenging. Also, in January and February, the abundant Ashe juniper trees in the area spew the much-despised pollen that causes cedar fever. This spiky pollen can cause problems even for people who don’t have allergies the rest of the year. In July and August, temperatures often soar above 100 degrees F.
On July 4, Mount Bonnell is a stellar vantage point for viewing several fireworks displays in and around Austin. You may want to carry a pad or a small chair up the hill with you since most of the seating options are just large boulders. You’ll need to arrive at least a couple of hours before showtime to get one of the prime viewing spots. The hilltop and the parking lot below fill up fast. For a less crowded experience, you may see fireworks displays on any given weekend during summer. Austin loves fireworks displays and often features them at a number of major events, ranging from auto races to football games. In early March every year, the ABC Kite Fest takes over Zilker Park. On a clear day, the view from Mount Bonnell of thousands of kites is truly a one-of-a-kind experience. The festival holds contests for the most creative kites, so you’ll have an opportunity to spot everything from scary dragons to flying Donald Trumps from an unusual vantage point. In the cooler months, serious fitness buffs use the long stairway for workouts. As you trudge up the stairway, don’t be surprised if someone runs past you huffing and puffing. Make sure you pack plenty of water, a picnic lunch, sunscreen, a camera and wide-brimmed hats. Remember that you have to haul it up 102 steps, so bring just what you need for a brief visit. There is a small shaded area on the viewing platform, but the spots with the best views are in direct sun. There are a few places to sit on the hilltop, but it’s really not designed for extended stays. Most people hike up, take a few photos, have a snack and head back down. On-leash dogs are allowed, but make sure they get plenty of water too. The bare limestone may be hard on their paws, particularly at the height of summer. Because the hilltop is almost entirely rocky terrain, make sure you wear shoes with good traction, and be particularly careful if the ground is wet. The view of the iconic Pennybacker Bridge over Lake Austin is the subject of many tourist photos. The relatively narrow, winding nature of the lake reveals its true identity as a dammed portion of the Colorado River. Boats pulling water skiers can often be seen cruising along the lake. The view of downtown is also breathtaking on a clear day. Nature buffs may want to take a closer look at the hillside itself, which is dotted with sprawling oak trees, persimmon, Ashe juniper and mountain laurel (whose blue springtime flowers smell like grape Kool-Aid). The hillside is also home to the bracted twistflower, a rare plant (also with a blue flower) that may soon be listed as an endangered species. Because the hill supports one of the few remaining populations of this plant, exploration beyond designated trails is strongly discouraged to protect the twistflower. As for wildlife, there are always a few spiny lizards scurrying around, and you might spot an armadillo. You can also get a glimpse of the lifestyles of Austin’s rich and famous. Several mansions along Lake Austin can be seen from Mount Bonnell. The hill can get a little crowded around sunset, but you can stick around after dark for stargazing. Just note that the park officially closes at 10 p.m. The skyline and nearby radio towers offer a view dotted with an array of steady lights and flashing beacons. The site is named after George W. Bonnell, who first visited the site in 1838 and wrote about it in a journal entry. Bonnell was the Commissioner of Indian Affairs for the Republic of Texas, and he later became the publisher of the Texas Sentinel newspaper. The top of Mount Bonnell is actually called Covert Park (much of the land was donated by Frank Covert in 1938), but few locals refer to it by that name. The stone monument commemorating Covert's donation remained in place in the viewing area until 2008 when it broke into pieces for unknown reasons. Community leaders raised money to have the rough-hewn stone monument restored, and their efforts earned an award from Preservation Texas in 2016. Another donation in 1957 by the Barrow family allowed the park to be expanded. While there are no large carnivores around these days, frontiersman Bigfoot Wallace described Mount Bonnell in the 1840s as one of the best places to hunt bear in the country. Legend has it that Wallace lived in a cave near the hill while he recovered from a serious illness. In fact, he stayed away so long that his bride-to-be thought he was dead and married someone else. However, the exact location of the cave has been lost to history. Caves are common throughout the Austin area. The hill was also used intermittently by Native Americans as a lookout point. A trail along the base of the hill was once a popular route for Native Americans going to and from Austin. The well-traveled route also became the site of numerous battles between white settlers and native tribes. On the way to or from Mount Bonnell, consider making a stop at Mayfield Park. A verdant 23-acre oasis in the heart of the city, the property was originally a weekend retreat for the Mayfield family. The cottages, gardens and surrounding land were turned into a park in the 1970s. A family of peacocks has called the site home since the 1930s, and descendants of those original peacocks still roam freely throughout the park. Among the park’s many delightful sights, there are six ponds full of turtles, lily pads and other aquatic plants. A curious tower-like building made of stone was once a home for pigeons. Decorative stone arches also dot the property along with 30 gardens throughout the park that are maintained by volunteers. The workers follow broad guidelines provided by park staff but also add their own touches to each of the garden plots, which means they're always changing and will include a mix of native plants and exotic species. It also gives the park a welcoming community feel since there’s always someone working on their own little garden in the park. Located on the grounds of Camp Mabry, the Texas Military Forces Museum traces the history of both early volunteer militias in Texas and the professional military forces going back to 1823. Kids and veterans alike will enjoy the displays of tanks, helicopters, self-propelled guns and jets. Indoor exhibits feature old uniforms, weapons, personal items and photographs. Specific battles of the Texas Revolution, the Civil War and conflicts with Native Americans are covered in-depth. History buffs will enjoy seeing original documents such as after-action reports, field manuals, World War I card files and even soldiers’ personal journals.